Run Millinocket for what you give!" 2019 Sea To Summit Maine Race Series! When you register for MDI and select 'Sea To Summit' you are automatically signed up for Millinocket and race series! Click HERE to learn more. This FREE event was started in 2015 to help a struggling Maine mill town that has been devastated by the closing of their major employer. Runner's World Magazine picked up the story shortly after our first edition and the rest is.... as they say, history! Participants are strongly encouraged to make lodging plans now as many properties fill to capacity very quickly. (see lodging links below) There are many nearby towns and Bangor Maine is just over an hour away. (scroll down to see all the amazing things that are happening and make plans NOW to attend! (please use these provided buses and DO NOT attempt to park near the race start. Using these buses will allow us to grow our event and show appreciation to this generous community for making them available. Keep in mind the race is FREE! PLUS .. Hamburgers, hotdogs, chili, pizza and bake sale for purchase! Just dOWNLOAD the FREE APP FROM DiscoverKatahdin.com to know what, when & where things are happening IN MILLINOCKET!!!! WATER STOPS: Typically these are runner driven, pop-up affairs. If you require fluids on a super rigid schedule we recommend carrying what you need, otherwise use what’s offered or even better organize a water stop with your friends! As of the 2nd edition in 2016 our race course became USATF certified, making it a Boston, NYC and Chicago Marathon qualifier. The course is two loop circuit, half marathon is one loop, full marathon is two. There is a pasta dinner, a craft fair/expo, bib pick up as well as an epic Saturday after party and a whole lot more in the works! This is definitely not a just run and leave event. Make plans now to come for the night or the weekend or forever works fine too! Q. What responsibilities do I have after I sign up, especially because the race is free? A. First off please don't register unless you are somewhat serious about coming in the first place. Although our race is FREE we still prepare bib numbers and accrue expense to prepare for you. We totally understand that life happens, but if you can't come don't just NOT show up, its very important to cancel your registration if you can't come so we don't spend money preparing for you. Q. How is Millinocket different than other races? A. Our race is free but it's certainly NOT a free for all. We still put on a highly organized race with one requirement, don't run Millinocket for what you get, run Millinocket for what you give. Please spend money, be generous and kind. Q. I can't remember if I signed up? A. Because our race is FREE you'd be surprised how many people sign up twice because they can't remember if they registered or not. Don't do this. Click HERE to check if you are registered if you aren't sure. Q. Is the course USATF certified and a Boston, NYC, Chicago Qualifier? A. Here are our USATF Course Certifications valid thru 2026. Q. How can I change races? (from the full to the half or vice versa) OR update my personal registration information? A. Please save the confirmation email your received at the time of registration (check those spam folders first, if you don't see it) and follow the direct link to your registration found there. You may also enter your confirmation code HERE or click the red 'help me retrieve the code' button. Q. When do you need to know if I'd like to cancel my entry or switch races? A. We need to have all cancellations race switches complete by November 8th. Remember our race is FREE but not a free for all. Please give us time to plan. To cancel your entry, please enter the code found in the confirmation email you received when you signed up HERE or click the red 'help me retrieve the code' button. Q. Will it be cold? Q. Are there water stops? A. Remember the race is FREE but in all of our previous editions a number of unofficial water stops popped up! Our best advice is to plan to be self sufficient and you'll be thrilled with any support you receive. Q. Is there an early start? A. There is NOT an early start option, if you require more than approx 5.5 hours to finish please plan for darkness by wearing reflective gear and a headlamp. Q. Are there course time limits? A. All are welcome to participate regardless of ability. Q. Can I organize something on the course such as music, fluids or other support? A. Absolutely, just show up and do it, just be sure to leave no trace. Q. Can I sell things? A. No. The race was created to help the struggling Katahdin region so unless you are a Millinocket area group, business or resident you may not sell things. Q. Is there a plan for inclement weather? Q. What should I know about the course? A. The first approx 6 miles after your exit town are run on a good gravel road. The next approx 6 miles are run on pavement. Runners should run on the left facing traffic on this paved section. Q. After the race starts can spectators follow along in vehicles on Golden Road? A. Please don't. This road is filled to capacity with runners. We need to keep Golden Road as clear of spectator traffic as possible to allow for emergency or offical vehicles only. Instead we recommend that spectators drive out the course on Lake Road (heading toward Baxter State Park) and cheer on runners as they exit Golden Road at Huber Road. Q. Where exactly is Millinocket? A. It's located about 1.5 hours north of Bangor ME. Q. Why should I stay on Saturday night after the race? A. Not staying is missing a huge part of the race. Stay and have the most fun everrrr, then enjoy a leisurely Sunday drive home. Q. Will I see a Moose? Q. Is the course hilly? A. If you are from Maine nope, if you are from Kansas, we're thinking maybe so! Q. Is it pretty there? A. It is absolutely stunningly beautiful and gorgeous! If you have additional questions please contact us but mostly stop asking so many questions and just come have fun!! 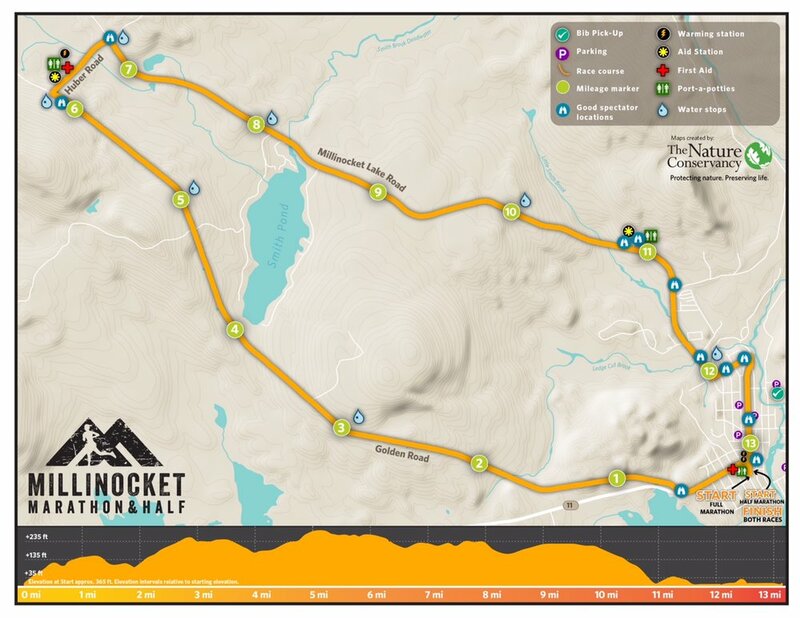 Click HERE to explore this very cool map created by Millinocket runner Hope Rowan! Course map provided by The Nature Conservancy. Click to enlarge. Town map provided by The Nature Conservancy. Click to enlarge. MEDALS! The ONLY way you will get a medal when you finish is by pre-ordering them. (duh! the race is FREE!) The design is handmade by people who live and work in Millinocket. Click HERE to order. In the unlikely event that you are not able to attend the Millinocket Marathon & Half, please cancel your registration at your earliest convenience-- although the race is free, their are still many costs associated with your entry. Thank you! >>> To cancel your entry, please enter the code found in the confirmation email you received when you signed up HERE, or click the red 'help me retrieve the code' button.